You hug the avatar of your repressed negative emotions, and tell her it's okay. She continues to have a bit of a breakdown, sobbing on your shoulder. Nurse-Mine, seeing that things have, uh... settled down a bit, wanders in to help you. She takes over hugging, comforting, and gently patting the bigger you, so you can explore ahead. You sneak off, and continue down the hall--taking a quick peek into the door on the far right. 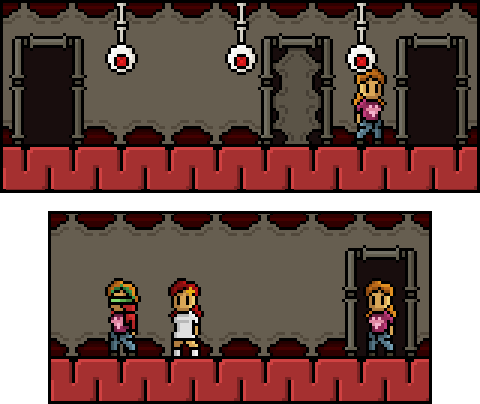 Inside is a room that appears to be an empty dead end, and... two more yous. "We should've brought tools," says the you in the visor. "Or weapons. Knives. Knives are tools and weapons." "How?," asks the you that's... your red? Or your... human acceptance of the concept of your red. It's a little vague. "Meditation," Visor-Mine replies simply. "Psychological conditioning. Make us see our subconscious selves as always being prepared for something like this." Red-Mine rolls her eyes. "We didn't know something like this was a thing, we couldn't have conditioned ourselves for it." "We should've known," huffs Visor-Mine. "Should've tested it first, on a rat or something. Maybe built a small scale model of the Odin machine in Bunker A. What we definitely should have done was figure out how to maintain our blood powers as an imprint." "It's..." Red-Mine sighs. "It's literally the blood. It's in the blood. The blood we don't have right now. We don't have blood." "We could find a way around it," Visor-Mine replies, not even missing a beat. "If we'd sat on this a little longer, we could find a dozen ways around the blood problem. ...We shouldn't have rushed this. Needed a plan." Red-Mine just shakes her head, throwing her hands up. They seem to be inspecting the walls, possibly looking for an alternate way out of the room. The big, angry you that was stalking the hallway likely had them trapped in here. Get their attention and tell them we've got the situation handled. And then go for a group hug, maybe. If that's the same Red that Mine's been regularly talking to (she certainly has a similar level of sass), then at least she'll sort of be accustomed to receiving hugs. She might get a kick out of the knowledge that Mine subdued the monster by being a sentimental idiot at it. Also ask what's up with Visor-Mine. Is she from when we over-synced with Vibe? ...yeah I have no idea why I thought Fuse's name was Vibe. I think it's the name of a transformer that kind of reminds me of him? whoops. The Red-Mine may be the little red. Or a representation thereof. She seems to have a flower in her hair. Anyway, try not to startle Fuse-Mine. This would be a bad time to accidentally trigger fire-powers. You know, now that I've read through the dialogue a couple times, I think that if Fuse!mine isn't litterally the over-synced section of her brain, then She's probably the personification of Mine's paranoia and tendency to overplan (so basically she's us). "I'm kind of with Red on this one: if we try to prepare for everything that could possibly go wrong we'll both fail to do so and never be done. Also, the big us has calmed down, if that's what you were waiting for." And visualize yourself with a flower in your hair. Also, hand Visor-Mine one of your scalpels, assuming you got more than one from the face. Pretty much this, but let them know the angry Mine has calmed down and is crying in the other room. Also, she has knives, if you really need them. Let them know you're trying to... collect yourself, so to speak, by getting all of the yous together peacefully. PokèMines. Gotta collect them all. No worries, we found a source of scalpels! Gotta be quick on the draw, though. Also we calmed Scary Mine down but maybe don't startle her anyways. Anyway, let's follow tradition; greet, assess hostility & hug where applicable. Relax fuse-mine. We've got this. Nurse Mine is back there comforting the pacified Mine that was formerly blind rage. Greet and have a chat. Try to figure out what they were trying to do and explain the current situation. Then get prepared to cut through and enter the next barred skin-door. EDIT x2: We should ask if we can borrow Red!Mine's flower to put in rage!Mine's hair. Ahahahaha, wondering how she'd look in his visors was exactly her reaction back then. Overplanning and endless mental stewing is exactly how comments read here and on discord. Greet. Introduce ourselves, take them back to the other two with a brief explanation, then move forward to the next door. Do we need to collect all the Mines in one location? Or do we need to merge with them somehow? In Visor!Mine's defence, immense preparation served us well in Hope's church and in many other places. Its the self-flagellation for not being prepared after the fact that does no good. when we talk, try not to startle them; I cans see fuse!Mine being a little jumpy and suspicious. Oh snap! The Mars flowers contain "blood" but I don't remember which type. Lasker or bioprinted. Was there a third type, second bioprinted? If it is bioprinted can Thale sense the flowers? I know he is not currently looking for them, but this is a concern. Wasn't it just the plant that fused with Deagle? Or did all of the stuff there have blood? It was just the plant in that one room, not the flowers. And it contained what is thought to be a prototype of the bio-printed imitation Mars blood Thale is using, less advanced, incomplete, not the same stuff. I admit it, I laughed when I saw Visor!Mine XD. Maybe she is the representation of the perfeccionism and the great amount of ideas we as the public put in the mind of Mine, taking the amount of personality we absorved from Fuse since he is also a bit perfeccionist? In whatever case... Scream. Scream while they don't know you are there. We can make a joke from time to time, and since they are us, I don't think they are going to take it too bad XD. After that, explain that Rage!Mine is crying her heart out in the shoulder of Nurse!Mine. The Nurse implied that there's more than one monster skulking about. Screaming right now could alert another monster to our presence, and it could lay waiting in ambush behind the next door.